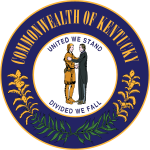 The 1980 United States Senate election in Kentucky took place on November 4, 1980, concurrently with the U.S. presidential election as well as other elections to the United States Senate in other states as well as other elections to the United States House of Representatives and various state and local elections. Democrat Wendell Ford won re-election, he defeated Republican Mary Louise Foust. ^ "KY US Senate- D Primary". Our Campaigns. Retrieved February 18, 2019. ^ "KY US Senate- R Primary". Our Campaigns. Retrieved February 18, 2019. This page was last edited on 2 March 2019, at 21:44 (UTC).